Cool Prototyping is specialized in design, Modification and Maintenance of many kinds of plastic molds, such as injection molds, blow molds, compression mold, Extrusion mold, and can also custom molds as required. Injection mold: Injection Mold a mold used to form a product using the injection molding process. 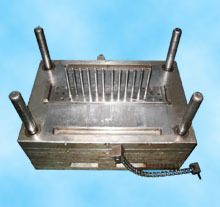 A standard injection mold is made of a stationary or injection side containing one or more cavities and a moving or ejection side. Following are the injection molds we have done for our customers.